Usually, subwoofer discussions start with tales of thunderous, booming bass that rocks the house. I’ve been using REL subwoofers for about 10 years now and that’s not what this is about. 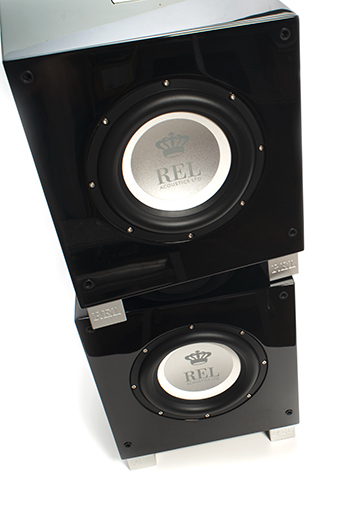 They will certainly add major low frequency extension to whatever speakers you choose to mate them with, but that’s not what REL is about. This is about adding scale to your system. Laurie Anderson said in the song “Language is a Virus,” that “paradise is exactly like where you are right now, only much, much better.” That’s what adding a REL (preferably two) to your system will do if you have it properly positioned and set up. You won’t find yourself thinking “that subwoofer sounds killer!” You won’t even know it’s there. But your system, enabled thusly will reveal more music than it ever has, and not just down low. Beginning one of many listening sessions with a pair of T7is in a 13 x 15-foot room with a pair of Raidho X-1 speakers as my initial references, Dave Pike’s rendition of “Bluebird” has more body, more realism than I am used to, even with the spatially superior Raidhos. The Raidho’s small woofers just don’t go down much past about 55-60hz with authority in this room, so using the RELs in this context is picking the low hanging fruit. The string bass is now fleshed out with authority, yet when the low keys on the piano are struck, you can feel it in your chest, and your soul. Adding a $2,000 pair of small RELs transforms an already lovely pair of $6,000/pair small monitors into full range masterpieces. Following the concise instructions on the REL website, the T7is are set up and dialed in pretty quickly. This is an overly simplistic analysis, but again, you know you have them set up right when you can’t localize them. 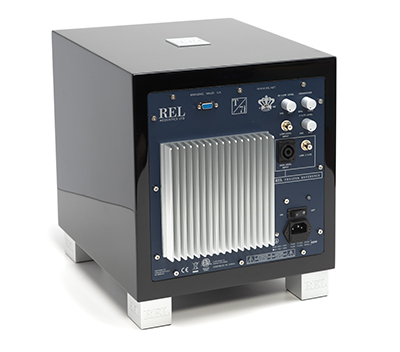 For those not familiar with REL, they prefer using a high-level connection from your amplifier’s output, accomplishing two things: your main speakers are run full range, making for a more seamless crossover and the sub picks up the exact tonal character of your power amplifier. They include a 33-foot cable with bare wire on one end and their Neutrik connector on the other. Those feeling the need can still plug in with preamplifier output, or via a .1/LFE channel in certain theater applications. But if you’re building a 2-channel system, I highly suggest doing it RELs way. You can read all of the pertinent specs on the T7i here, (https://rel.net/shop/subwoofers/serie-ti/t7i/) but most important is that these enclosures (12”H, x 14.5”W x 15”D) barely take up more than a cubic foot. An 8-inch driver fires forward, with a 10-inch passive radiator facing downward. A 200-watt, class AB amplifier, a refined version of what has served previous REL subs well drives the T7i. The two controls requiring your full attention are the ones marked “crossover” and “hi/low level.” Because your main speakers are already running full range, this control is a low-pass control, determining how high up the REL goes, and can be varied from 30hz all the way up to 120hz. Like the level control, these are stepped controls with extremely fine adjustment capability. If you experiment with multiple placement options or main speakers, this makes it easy to count how many clicks you’ve turned the controls, so you can always go back to where you were. As suggested by REL’s John Hunter, now is a great time to optimize your main speakers for the maximum bass output without the REL. The further down you can get your mains to play, the easier it will be to integrate the REL seamlessly. I like to start with the crossover control all the way down at 30hz and slowly, gently bring the level up until the presentation takes on a fuller sound, without becoming boomy, or overloaded in the mid bass region. While Hunter (and all of his disciples) are fond of Jennifer Warnes’ “Ballad of the Runaway Horse” tune for optimizing upper and lower bass balance during speaker setup, I’m finding excellent luck using Frank Zappa’s voice. Because you just can’t listen to that damn horse song all the time. Using the famous Zappa track “Montana,” I find when the REL is set to perfection, Zappa’s voice doesn’t get overly foggy, cloudy, muddy. It just gets bigger. He sounds like GOD ZAPPA when its right. This will get you close. Then a bit of moving the REL around and slight fine tuning – perhaps with a friend to help speed up the process and you’re rocking. Even the most OCD person operating solo should be able to nail this in about an hour. Hunter adds here that they also like track 4 from the soundtrack of the 90′s movie Sneakers to dial the REL in itself. When perfectly optimized you can clearly hear the second skin (he calls it a “double-tap”) of the concert bass drum as the compression wave from the softly struck mallet on the first membrane passes through the body of the drum and pressurizes the second skin. This track is also excellent for determining phase and crossover settings, with level falling in to suit. Unless you are driving the hell out of an incredibly large main pair of speakers, the chance you will overdrive the T7i is slim. Even a long playlist of Aphex Twin and similar tracks, I was unable to overdrive the T7is, still mated to the Raidhos. Though Hunter suggested I use larger RELs for my Magnepan Tympani 1Ds and .7s, even in a larger room, the T7is offered more than satisfying results – part of this will be determined by your room and listening habits. After living with the T7is for some time and getting used to their character, I also found them easy to integrate with the Dynaudio Special 40s, Totem Signature 1s, and the Graham Audio LS3/5 monitors. Both the B&W 705 and 707S2s were a good match too. Bottom line, before you invest in that next, bigger pair of speakers, you might just consider a pair of T7is. They come covered in gloss black (like our review samples) or gloss white, making them easy to blend in to your décor just as easily as they blend into the soundstage. Exactly like the 212SEs that I use in my main reference system, after you get over the initial amazement of using the T7is, it’s easy to forget them – until you turn them off. Yeah. It’s the audiophile equipment of pinching yourself. Shut em off from time to time, to really see what you’re getting. Just as the 212SEs have become a permanent fixture in my main system, the T7is are now a permanent reference component in room two. In the context of some carefully chosen gear making up a system worth about $30k, the $2k investment in the RELs increases the desirability of the entire system by about 100%. There’s just no better value in high end audio for this reviewer than adding a pair of RELs, regardless of which model you choose. What I really enjoy about these smaller, less expensive subs, is that there has been no compromise in the T7is in terms of what makes the big RELs truly great. The cabinets, though slightly simpler in design, are still executed to the same level of fit and finish as the top models. Ditto for the drivers and electronics. Hence, the T7i is more than worthy of one of our Exceptional Value Awards for 2018. If you feel so inclined, read my review of the 212SE – everything that I found enticing with the 212SE is here with the T7i. Think of the 212SE as a full bottle of your favorite adult beverage and the T7i as a hearty glass full. Regardless of the music you play through your system, once it becomes REL equipped, you’ll notice much more depth and ambience way up through the midband. But what fun would a pair of subwoofers be without digging some bass heavy grooves? I’m sure you have your favorites, so now that class is dismissed, enjoy!